With a population estimated to be over 221,000, Scottsdale Arizona is a thriving city in the eastern area of Maricopa county. With such a vibrant city there is a need for the delivery of all manner of legal papers such as summonses, subpoenas, writs, as well as other court documents. A certified Arizona process server such as those employed by ASAP Serve who understands the various jurisdictions and legalities of Scottsdale Arizona can fulfill this need with greatly increased ease, affordability, and efficiency. For a process server near you in the Scottsdale area, trust the fast and affordable experts at ASAP Serve to get your documents delivered. When you need adoption papers, child custody agreements, and divorce decrees delivered, trust the professionals at ASAP Serve! 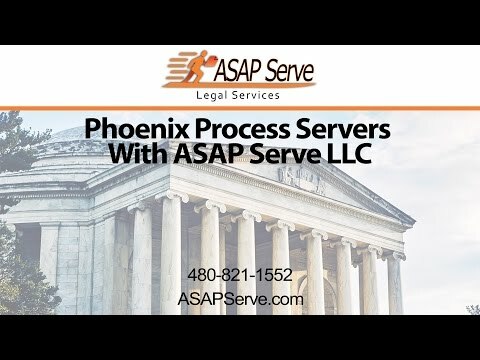 To get your legal documents delivered on time by affordable process servers in the Scottsdale area, contact ASAP Serve today! When you need legal documents such as subpoenas, complaints, and summons to be served in Scottsdale, ASAP Serve is up to the task! Do I need a Process Server in Scottsdale? If you are involved with any of these, or any other type of legal case, it is advisable to consult with a process server familiar with Scottsdale Arizona. Process servers such as ASAP Serve are the most affordable and efficient method of ensuring that your legal documents reach the right hands in a timely, secure manner allowing you to focus on other concerns. Scottsdale Arizona is its own city. It has its own laws and regulations that a process server must follow to ensure that your legal documents are delivered properly and on time. ASAP Serve employes only certified trained process servers who understand the situation in Scottsdale Arizona allowing them to easily navigate these regulations and deliver your papers. During this time they will also keep you abreast of the status of your case and answer any questions you may have. A misstep at this juncture of proceedings can result it frustration, additional costs, extended time frames, or even potential dismissal. A professional process server such as ASAP Serve can ensure that the right people receive the right documents at the right time. Fast Service — First Attempt Same or Next Day: Legal papers are out for service of process the Same or Next Day. Quick Status Reports — We get you the info: ASAP Serve gets our clients’ service status by email or telephone the day of service. No Mileage Charges: We flat rate all of or services so you, the client, will know exactly what the charge(s) will be. Skiptracing, Stakeout and other services available: If we can’t serve your defendant, witness or other party, we’ll put our skiptracing and other resources to use. Our Guarantee: Because of our experience in the industry, we are confident you will be please with our services. Each party to be served is documented on a separate Proof of Service or other Declaration. Charges are per person/location. Not founds and cancellations are charged at rates for service. When you need your documents to be served in a timely and efficient manner by affordable process servers in Scottsdale, ASAP Serve has the means and expertise to get the job done. Serving all areas in Scottsdale including 85262, 85255, 85259, and 85260, our process servers are both professional and fast, making sure your legal papers are served to the right person as quickly as possible.